While the United States has long been a top destination for the world's best and brightest, it has fallen short when it comes to fully tapping the skills and training of these newcomers. As a result, nearly 2 million immigrants with college degrees in the United States—one out of every four—are relegated to low-skilled jobs or are unable to find work. 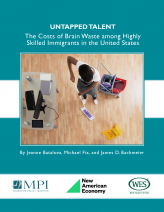 This skill underutilization—often referred to as brain waste—comes at a significant cost to families and the U.S. economy: College-educated immigrants employed in low-skilled work miss out on more than $39 billion in wages. And as a result, federal, state, and local governments lose out on more than $10 billion in unrealized tax receipts, according to this study, which offers the first-ever estimates of the economic costs of brain waste. Brain waste should be particularly concerning given that an ever-growing share of new arrivals are highly skilled: Almost half of immigrants entering between 2011 and 2015 held at least a bachelor's degree, compared to 33 percent before the recession. Highly skilled immigrants face a range of barriers to employment at their skill levels, among them: difficulty getting foreign credentials recognized, unfamiliarity with the U.S. labor market, employers’ negative perceptions of the quality of foreign education and work experience, limited English skills, and a shortage of education programs to bridge skills deficits. As the report finds, immigrant skill underutilization varies by state. Florida had the highest rate of immigrant brain waste (32 percent) among the states examined, while Michigan and Ohio had the lowest (20-21 percent). The report is accompanied by fact sheets for eight states: California, Florida, Michigan, New York, Ohio, Oregon, Texas, and Washington State. IV. What Are the Critical Determinants of Low-Skilled Employment among Immigrants?